The early 1980s were a great time to be reading Marvel Comics. Phoenix became Dark Phoenix and the X-men were never the same. Spider-man gained a new arch-villain in Hobgoblin, and an alien costume. Daredevil was battling The Kingpin, Bullseye and assorted ninjas. Aunt May gained cosmic powers and saved the world from Galactus. What, you don’t remember that last one? In reality, it was just a gimmick. The stories were written & edited months before the editors left for the Comic-con. The issues actually edited by the assistants contained typical, “normal” stories. I was 12 at the time, probably just the right age to appreciate the (mostly sophomoric) humor. One thing I enjoyed was the “comics insider” nature of the books. Most of the jokes would only be understood by longtime readers. Back then, Marvel made the readers feel like they belonged to a community, these stories felt like a "reward" for a Marvelite like myself! 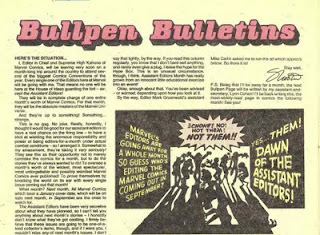 This blog will review & recap stories from all comics that participated in Assistant Editors’ Month. Most of the issues that month featured weird/offbeat/humorous stories. Some were great, some were just, okay. But they were certainly all memorable stories. Some just had regular stories, followed by a humorous short, or a one-page “joke” pin-up. Some sites/blogs have covered AEM(I've linked to them), but I plan to go a little further than they did. This blog’s creation is highly inspired by the aforementioned article in ‘Back Issue’(you can order it here. I’m sure I’ll be referencing that article a few more times. And I'd also like to thank all the Marvel creators who wrote,drew or edited the stories that will be covered here. 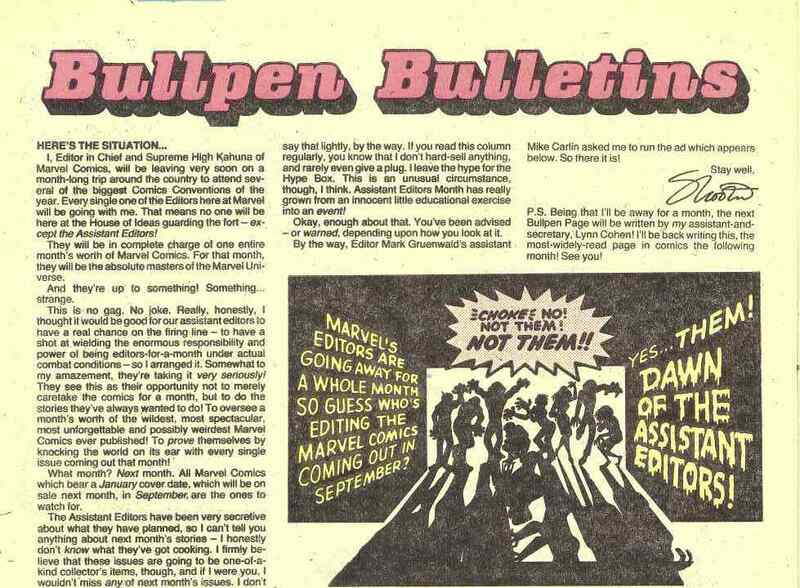 So if you loved ‘Assistant Editors’ Month’ as much as I did, or you’ve never read any of the stories, I hope you enjoy this blog.